Bobbet's Butcher Shop is on the north-east intersect with Pollen Street. Today the site of a Garage. The large drains can be seen (fenced areas), under which the Noke Noke Stream flows out to the sea - the cause of many a Shortland flood in this area. Richmond Street climbs up to Block 27 in the distance (east). Typical of roads into the early 1900s, see how narrow the actual 'road' is. 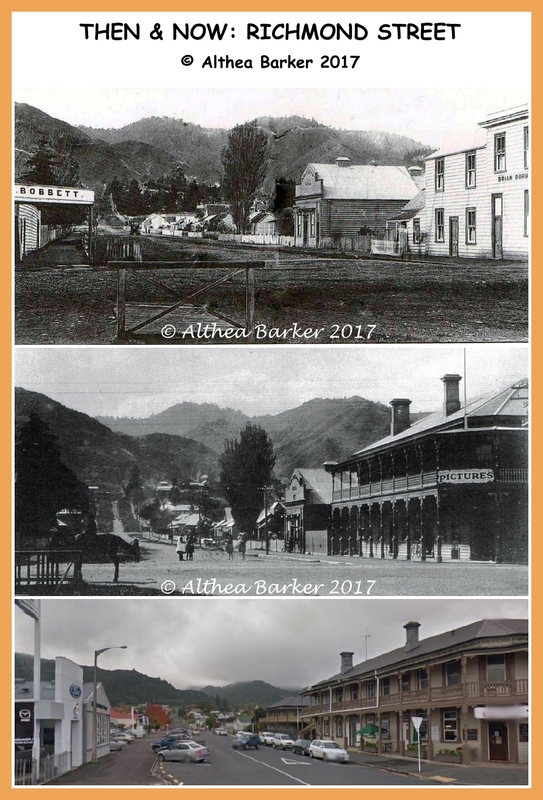 Centre right is the Oddfellows' Hall in the first two photographs, now the site of Te Korowai. Later used for dances and auction mart for decades after the Lodge moved to other premises. Who remembers Ed Mitchell's Second-hand shop? Or skating at the hall? The changing face of the Brian Boru can be seen comparing the first two photographs. Extensive renovations were carried out in 1904, only to be followed by a large and fatal fire in 1905. The building was repaired and still stands today as The Brew cafe. Richmond Street in 2017 has been extended west, and is the site for the Richmond Villas Retirement Homes. Thames (NZ): TCDC WW100 Messines Forest axed!